I would definitely consider Kosuke Kitajima the face of Japanese olympics this year. 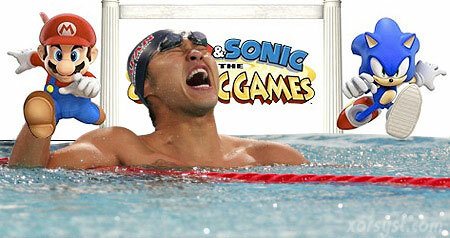 Kitajima lived up to expectations and took gold for the 100m breaststroke. When preparing for the Olympics, it takes years of tough training and physical preperation. However, many times we don’t hear about the mental prepreation taken by the athletes. See, Mario does the breaststroke. And thus, it’s perfect mental training for envisioning the actual Olympic hall. That’s the perfect sponsorship, and I’m sure we will be seeing the game fly off of shelves.